Much like Gutenberg did for the Bible (and knowledge in general) with his printing press, the Internet has commoditized information for the modern age. It’s an evolutionary step in communication, allowing just about anyone to quickly and easily spread their message to virtually everyone on Earth with a computer or mobile device. But with great power comes great responsibility, and perhaps most important is the responsibility we have to ourselves and our loved ones. The rewards of going online are vast, and the risks are few, but one notable risk is the possibility of becoming addicted to the Internet. Much like alcohol, gambling, shopping, etc… surfing the Internet can be habit-forming for some, and its consequences can be just as damning. It’s because of that reason that it’s important to know how to spot the warning signs of Internet addiction in yourself or loved ones before it’s too late. 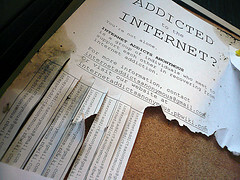 People who are addicted to the Internet tend to allow their time online to interrupt or damage time outside of the web. When a regular disregard for jobs, family, school, or other responsibilities are encountered so the person can be online, the potential for Internet addiction is high. Addicts tend to fuel their own fires by spending increasing amounts of time online. And often times if they do try to reduce how much they’re on the web, they are unsuccessful in controlling their behavior and cutting back. Many times the person doesn’t even realize how long they’re on the Internet. If the person becomes increasingly moody, “out of sorts”, or just doesn’t act like themselves when they’re away from the web, they could be exhibiting signs of addiction. Behavioral changes such as lying and covering up their tracks is a common tactic of the Internet addict. The person will attempt to conceal how much they’re online, or they may even try to change the subject and become irritated when pressed about their time online. The addiction can manifest itself in such a way that activities that were once pleasurable are now cast aside and neglected. This includes relationships, whether with friends or family. The Internet will become their primary focus. In many cases an Internet addict is trying to feel better about some aspect of their life, and using the Internet is like a drug that helps a little (many times they will feel euphoric when they first go online), but the more they use it the less it helps, so it becomes a never-ending circle. Ask an Expert: Is my son addicted to the Internet? Internet addiction — Societal Problem?